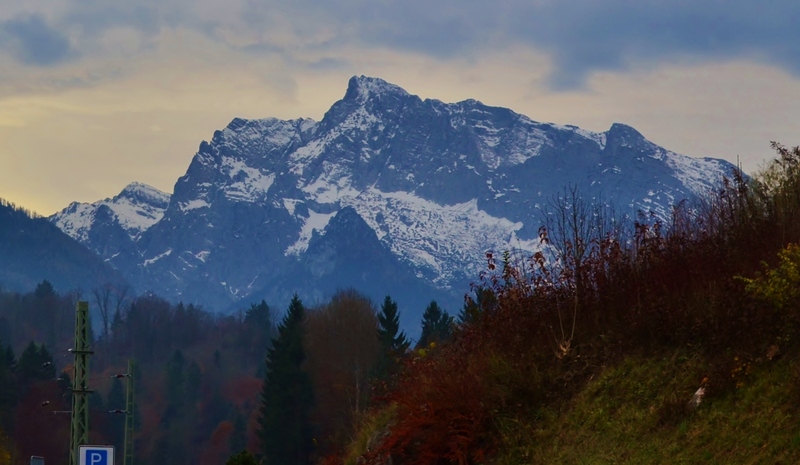 The mountains around Berchtesgaden, Germany. We’re creeping into mid-November, and signs of the coming season abound: Christmas trees and Christkindlmarkt stands are beginning to pop up like daffodils in the early spring. And like daffodils, they do this slowly, organically. First, an empty market hut or two appear, then another and another. A scattered tree here or there, lying on the ground one day. Upright in a stand a few days later. Eventually joined by others. Until, about the last weekend of November, the Weihnachts markets will be in full bloom in their own fields–the market squares of towns across Germany, Austria, much of Europe. Merchants may push the season early, but at this point even Mother Nature has joined the hubbub by pitching in frost and snow (in the early mornings, in the high hills). Here are a few photos from the past few days around Salzburg, Austria, where signs of the season are unmistakable. 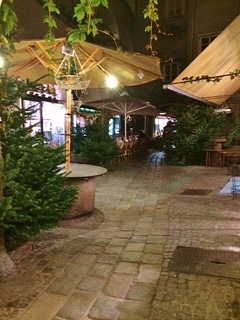 In the streets and alleys of Salzburg, some trees are up and preparations are being made for the market squares. The empty booths will soon be filled with vendors peddling chocolates, waffles, gingerbreads, mulled wine (Gluhwein), traditional wooden Christmas baubles, cheeses, sausages, . . . the list is endless. Preparations in Salzburg, on a foggy night. The green huts will soon be stocked with gingerbread and mulled wine. 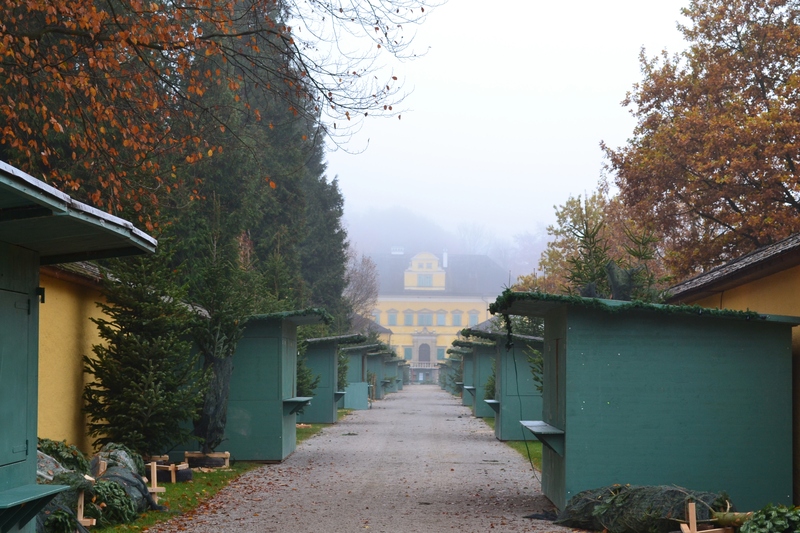 And at the edge of the city, Hellbrunn Palace (once home to the Hapsburg royalty) promises to burst into full Christmas bloom very soon. I’m told that the palace (at center of the photo) has 24 or 25 windows on the façade that faces this market-row, and the windows will all have shutters pulled and wreathed in the days ahead, so that it may become an advent calendar, with one window to be opened each day of advent. Watch this space in the weeks ahead: I’ll post photos when the season is in full bloom. I love the idea of the Hellbrun palace windows being opened one-each-day like an advent calendar! Yes, I would love to be there to see that. Brilliant idea. 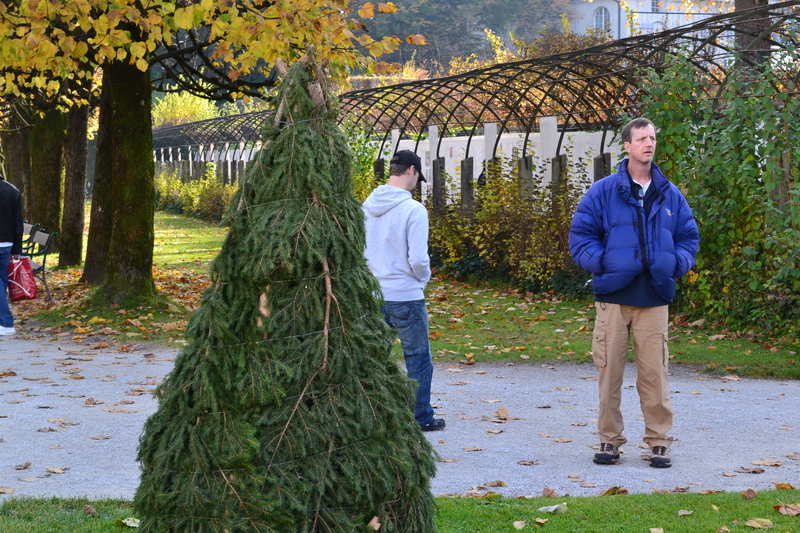 How does Salzburg dress up the Christmas trees in Mirabell Gardens? I love snow, but In a couple of months I will miss heat! Come January, we’ll have to trade photos out our windows and live vicariously through each other! Ha! That might just get us through. And yes, I remember the long grey misery that in Jan into Feb. The Christmas markets that have sprung up all over the UK just don’t do it for me. For authentity it needs to Austria, Germany, Czech etc. I have done Salzburg at advent time thrice now and it just makes me incredibly joyful! Yes, they are fabulous, aren’t they! We lived in Yorkshire for 4 years and did enjoy Christmas markets that occasionally popped up–but they weren’t the same. Although, one year we went to Edinburgh and really enjoyed that market. The one in Hyde Park is a dreadful sham. Enjoyed the one we went to in Nice one year. Real reindeer always clinch it!